Our studio and workshop is situated on the river end of beautiful, leafy, Oxford St. and is the home of award winning Jeweller Paul Bodman. Here you can view a stunning range of jewellery including exquisite, handcrafted engagement rings, wedding bands, eternity rings and fine jewellery pieces. Paul will create with you your unique, dream piece. 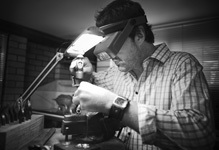 Using a combination of traditional hand making and cutting edge Computer Aided Design, he creates jewellery of the highest quality and craftsmanship.